“We are minstrels of the Lord - who move minds and hearts of men and women and raise them to spiritual gladness” - St. Francis of Assisi. This message has inspired Sister Helene Schneider, OSF in her work as a Franciscan Sister. No matter where she has traveled or the work she has done, she has been a minstrel to others. Sister Helene was raised on a farm in Belleville, IL and is the youngest of three children with an older brother and sister. When she was a teenager her father said that one day he would be proud if one of his children became a priest or sister. 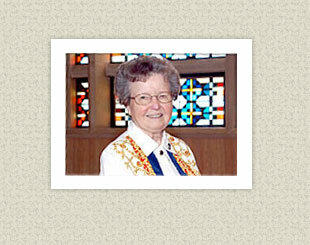 “I believe that he planted a seed for my vocation,” Sister Helene said. When she was 14 years old, she had a ruptured appendix and was a patient at St. Elizabeth’s Hospital (Belleville) for three weeks. “Sister Heliana Kleine-Jaeger was my night nurse and talked about St. Francis and religious life every time she visited me,” she said. After finishing high school, she worked at the local Agricultural Adjustment Agency and would spend Saturday nights dancing with her friends at the Belleville dance hall. Although she dated boys she “somehow did not feel a sense of fulfillment” in her life. When she felt called to religious life, she went to see Sister Heliana at St. Elizabeth’s and told her of her intentions. “Sister Heliana took me to meet the Sister Sabina Boehler, the Superior, and both of them were overjoyed at my decision,” Sister Helene said. This was July 1947 and she Entered the Community in September. “I wanted to become a nurse and so during the Novitiate, I completed the necessary studies and became a registered nurse – graduating from St. John’s School of Nursing in Springfield,” Sister Helene said. “Over the years I have met some wonderful people in our hospitals where I was living and working including Alverna Home Nursing Center (Chicago), St. John’s (Springfield), St. Joseph’s (Highland), St. Mary’s (Streator), St. Francis (Litchfield), St. Elizabeth’s (Belleville), and St. Vincent (Green Bay, WI). When she was stationed in Streator, the Sisters were changing their clothing and veil they wore. In making this change, the Sisters needed some help with their hair style since it now was visible. The nurses in the Emergency Room, where Sister Helene was working, asked if she wanted to help the Sisters with their hair. They encouraged Sister Helene to enroll in School of Cosmetology in Streator where she became a licensed beautician. “One day a woman came to the beauty salon said she wanted to look like Jackie Kennedy. I said with a laugh, ‘Lady, I’ll do my best but you do have to consider what you have to work with!” Sister Helene continued her work as a beautician for the Sisters and patients in the hospitals over the years. Since that time, Sister Helene’s recent assignments included serving as the hospital chaplain and beautician at St. Joseph’s Hospital (Highland, IL) and later as chaplain at St. Elizabeth’s. In her retirement years in Belleville, Sister Helene keeps active with a membership at the YMCA and attends arthritic class three times a week. One of her hobbies includes designing greeting cards for her family, friends, and Sisters. “As I reflect on my life as a Sister and the dedication of my life to serving God’s people, I feel that I have reached out to many more people. If I had to do it all over again, I would do it exactly the same way. It has been a very rewarding life which I am grateful to have been called to serve. I have always enjoyed life and continue to do so and find that even in my current age I can still dance and 'jitter-bug' if I have a good leader,” she concluded.